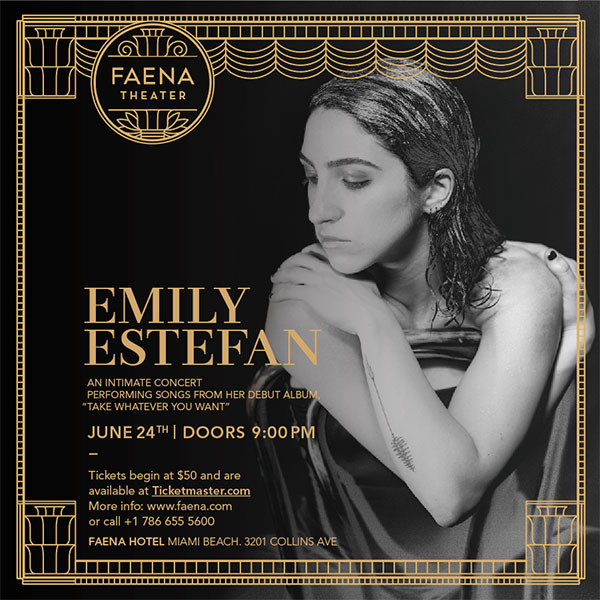 Faena Live welcomes rising artist Emily Estefan for an intimate concert on Saturday, June 24 at Faena Theater. The up-and-coming songstress will perform tracks from her debut album, “Take Whatever You Want.” The album, released in February 2017, landed on four Billboard Charts, including Heartseekers (No. 28) and R&B Current (No. 27), and showcases Estefan’s remarkable, jazz-inspired sounds that are sure to wow audiences of all ages. Channel your inner rockstar at Faena Theater with Rock the Mic, an unconventional karaoke experience in which guests take center stage while live band Higher Ground supports your pitch-perfect belts and croons along the way. Following your on-stage debut, relive your five minutes of fame with a full-length video of your performance, shot from four different camera angles and edited on the spot to share (and brag about) within minutes. Free & open to the public. RSVP to party@faena.com to choose your song and reserve your spot. For more information, visit www.faena.com or call +1 786 655 5600. Illusion is brought to life at Faena Theater with Kevin & Caruso’s dazzling spectacle, Magique. The family-friendly show, enjoyable for ages 6 and up, offers a dose of comedy with a splash of cirque, accompanied by powerful soundtracks, interactive multimedia backgrounds, stunning special effects and signature mind-bending acts. Shows Sundays at 7:00 pm and Tuesdays at 8:00 pm. Tickets begin at $35 for children and $55 for adults, and they are available at Ticketmaster.com. For more information, visit www.faena.com or call +1 786 655 5600.